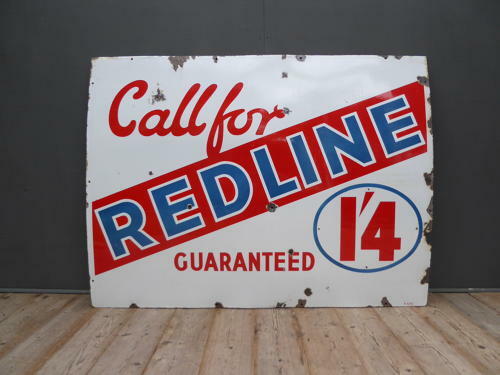 A large vintage enamel advertising sign for Redline Motor Spirit. A fantastic & highly decorative example featuring some fantastic colours, typography & pricing. Formerly known as The Union Petroleum Company, Redline Motor Spirit was formed in 1931 & later merged with Glico to form Redline-Glico. After the Second World War the company was taken over by The Anglo American Oil Ciompany. A wonderful piece of motoring memorabilia. Wear commensurate with age, very good overall with associated chipping, areas of minor loss & small holes. Unrestored. UK courier service available at £55 tracked & signed for 48 hour delivery.